The last time Jose Fernandez took the mound, it was September of 2013 and the phenom lit up the Braves in Miami with both his arm and bat. Coming off his Rookie of the Year winning season, Fernandez dealt on Opening Night, beating Colorado with nine strikeouts and no walks over six innings. Run support was plentiful in the first match up of the four-game opening series. Marcell Ozuna finished the night just a triple shy of the cycle, and Casey McGehee tallied two hits and four RBI in a 10-1 rout of the Rockies. Fernandez’s win makes him 10-0 with a 1.21 ERA at home since last season. On Tuesday night, four runs of support were barely enough for the Marlins as Nathan Eovaldi was stellar on the hill. Eovaldi threw six innings of two-run ball with a fastball that topped out at 99 mph. Steve Cishek recorded his first save of the year, and the Marlins improved to 2-0. Giancarlo Stanton homered and drove in three runs on Wednesday night, but it wasn’t enough as Colorado scored six runs on Henderson Alvarez, who threw just three innings in his first regular season start since his no-hitter on the final day of the 2013 season. Kevin Slowey curbed the Rockies’ offense in his four innings of shutout relief, but Miami’s bats could not quite make up the deficit and they fell 6-5. It was better late than never on Thursday evening when Stanton, McGehee and Garrett Jones all collected eighth-inning RBIs during a two-out rally that put the Fish ahead of Colorado. Steve Cishek earned his second save, and has now converted on 31 consecutive opportunities. The Marlins won 8-5 and improved to 3-1 on the season. Currently a half-game back from the Nationals for first place in the NL East, the Marlins begin a home series tonight against the Padres. 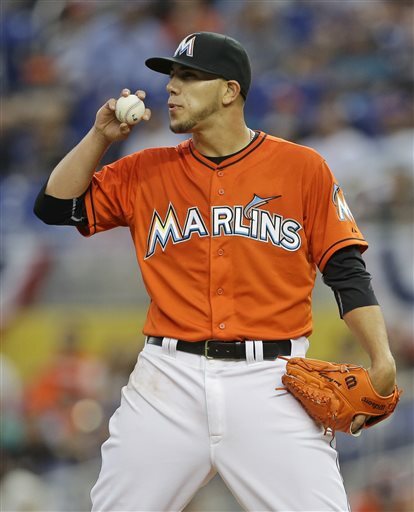 Jose Fernandez will take the mound tomorrow night in his second start of the season.